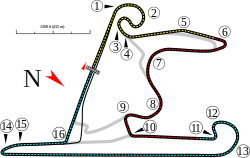 The 2013 6 Hours of Shanghai was an endurance auto race held at the Shanghai International Circuit in Shanghai, China on 9 November 2013. The race was the seventh round of the 2013 FIA World Endurance Championship season. The race was won by André Lotterer, Benoît Tréluyer and Marcel Fässler of Audi Sport Team Joest. Allan McNish, Tom Kristensen and Loïc Duval won the World Drivers' Championship at the event after finishing in third place. ^ "Audi Wins Shanghai Thriller, McNish, Kristensen Duval Clinch Title". sportscar365.com. John Dagys Media, LLC. November 9, 2013. Retrieved December 4, 2013. ^ "FIA WEC 6 Hours of Shanghai Qualifying Practice Final Classification" (PDF). fiawec.alkamelsystems.com. Fédération Internationale de l'Automobile. November 8, 2013. Retrieved December 4, 2013. ^ "FIA WEC 6 Hours of Shanghai Race Final Classification" (PDF). fiawec.alkamelsystems.com. Al Kamel Systems. November 9, 2013. Retrieved December 4, 2013.